From left to right, Alderman Roberto Maldonado, Jose Lopez, Executive Director of Puerto Rican Cultural Center, Maggie Martinez, Block Club Federation Executive Director and Oakton College Emeritus Instructor, Richard Reeder. 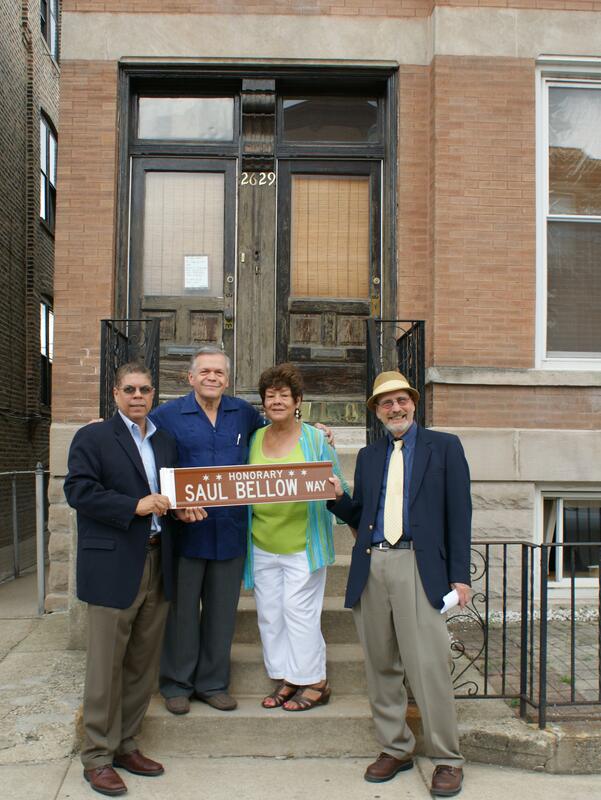 On June 11, 2012, a day after Saul Bellow’s 97th birthday, the 2600-hundred block of West Augusta Boulevard was designated “Honorary Saul Bellow Way,” to honor his great literary contributions to the Humboldt Park community and all of Chicago. Alderman Roberto Maldonado, with whom I worked with many years ago in Chicago city government, was the city official that made this happen. I had the honor of speaking at the ceremony along with the Alderman and Chicago Library Commissioner Brian Bannon. Alderman Maldonado represents the 26th ward, the area that Bellow spent many of his formative years in Chicago from 1924 to 1934, mainly at 2629 West Augusta. Bellow attended Lafayette and Columbus elementary schools, Sabin Junior High and Tuley High School. The name of the protagonist in possibly his greatest novel, The Adventures of Augie March, was a nickname derived from Augusta Boulevard. Many of his other novels, novellas and short stories had Humboldt Park settings. In 1976, Bellow became only the Chicago writer ever to win the Nobel Prize for literature. He is the only writer to win the National Book Award for fiction three times. He also was the recipient of the Pulitzer Prize. After a short time at Crane Junior College (now Malcolm X College), Bellow studied at the University of Wisconsin and Northwestern University majoring in anthropology. But writing fiction was his passion, and he soon abandoned his anthropological studies. He had a number of adjunct faculty positions including those at the University of Minnesota, Bard College and the University of Puerto Rico to supplement his income as he pursued his writing career. Eventually Bellow returned to Chicago where he joined the faculty of the University of Chicago’s Committee of Social Thought. At age eighty, he accepted a faculty position at Boston University. Bellow died in Brookline, Massachusetts April 5, 2005, two months shy of his ninetieth birthday. These words of Bellow ring as true today, as they did then. Patricia Porter led a group of us from the city up the dilapidated stairwell to the fifth floor of the Lexington Hotel, located at Michigan and Cermak, where she showed the rooms of a suite that Al Capone occupied from 1928 to 1932. It was hard to imagine Scarface and his cronies relaxing and doing business in these same rooms amidst the cracked walls and ceilings now surrounding us. Pat’s organization, the Sunbow Foundation, had recently bought the hotel with funds received mainly from the city of Chicago to train minority women in construction skills while rehabbing the decrepit hotel in the process. The Jane Byrne administration had originally hoped to house an International Women’s Museum and Research Center at the hotel as part the 1992 Chicago’s Fair, commemorating the 500th anniversary of Columbus’ discovery voyage from Spain to the Americas. I first met Pat in the summer of 1981 when she visited me in my office at the Mayor’s Office of Employment and Training. A tall, imposing woman wearing work boots and overalls, she came unannounced and plopped herself into an empty chair in my cubicle. She related to me a story that an aide to Mayor Byrne told her that my office was going to be giving her a $500,000 contract with federal job training funds. She said to me that I was the guy that City Hall told her to see to make that happen. The only problem was nobody at Byrne’s office told my boss who claimed he knew nothing about it. But Pat had made up her mind not to leave the office she had a finalized contract commitment. She sat in my cubicle for five hours, waiting with inordinate patience, staring at me and the walls, before the official communication came from Byrne’s office authorizing the contract for the Sunbow Foundation. At first, Sunbow began doing small rehab projects at a South Side YWCA and a battered women’s shelter. Several building trades unions bought into the program, providing carpenters and masons as instructors for the trainees. These unions made Sunbow part of their pre-apprenticeship programs, and the women trainees hoped eventually to become fully apprenticed carpenters and masons. Sunbow had some initial success, and then it began rehabbing parts of the Lexington. When Mayor Harold Washington got elected in 1983, his administration acceded to the wishes of neighborhood groups that believed that city funds allocated to the 1992 World’s Fair should be rechanneled for more needed services and programs in the communities. Chicago pulled out, allowing Seville, Spain, to host the Fair. However Mayor Washington was committed to Sunbow’s program and authorized an increase in funding for the organization that allowed it to purchase the Lexington in 1985. The Lexington had been built in 1892 to accommodate the many visitors expected to flock to the South Side to visit the Columbian Exposition. President Benjamin Harrison stayed there while visiting the Exposition. For several decades, the Lexington maintained its reputation as one of the more stylish hotels south of downtown. The Depression and the gradual decline of the neighborhood took its toll on the Lexington. In 1938 the hotel changed its name to the New Michigan Hotel, but the downward slide continued for the next four decades. It basically became a dangerous transient flophouse, housing prostitutes and drug-dealers. I remember the down and outers hanging out around the place when I ate regularly at Mama Batt’s, a Jewish restaurant-deli that leased retail space on the ground level, when I worked for the County in an office a block away from the hotel. Eventually, the hotel closed its doors to the public in 1980. Sunbow’s work on the Lexington proceeded at a snail’s pace. Federal job training dollars were being cut significantly in the second term of President Reagan’s administration, and Sunbow was barely able to stay afloat financially. Pat Porter somehow made contact with the television personality Geraldo Rivera in 1986 and convinced him that there was a good chance that Al Capone had kept a sealed vault full of money in the basement of the Lexington. Pat secured a lucrative consulting contract from Geraldo. Millions watched his TV show as the vault was opened, revealing nothing but a Stop sign and a couple of empty gin bottles. Sunbow dissolved in 1987 due to lack of funding. The Lexington Hotel was demolished in 1996. The McCormick Place Convention complex now extends across the street of the site of the old hotel. Tens of thousands of conventioneers now pass the site each year, unaware they are perhaps in the shadow of Al Capone’s ghost.